Step into the wild, wild west and see how much money you can come out with! NetEnt have time and time again shown themselves to be one of the more innovative developers to enter the fray in recent times. 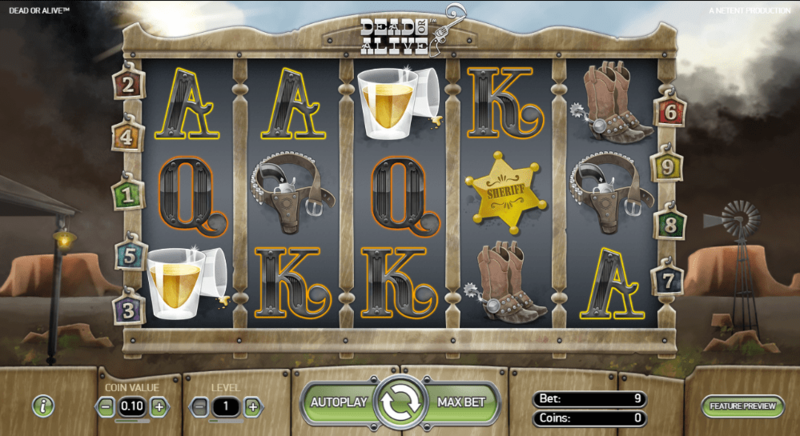 Dead or Alive is yet another western slot to enter the new online slot spectrum, a slot that is incredibly fun to play and comes with a massive list of additions for you to sink your teeth into. 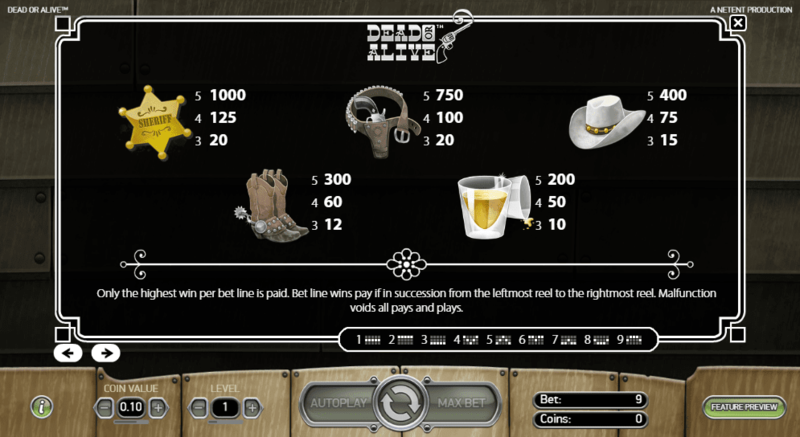 Dead or Alive is a 5 reel by 9 pay line game, one that comes with a 2500 coin jackpot for players to try and win with every single spin that the players spins on top of. The RTP percentage sits pretty at around 96% which will make you a lot of money for simple spinning. Find other games by Net Entertainment here at Sbaby! Wilds: The games wild symbol takes the shape of the wanted poster symbol. This symbol, when matched, will essentially substitute for all other symbols bar the scatter. Wilds come with quite a boost to scores also for just matching them outright! Free Spins: Free spins are vital in any online slot that they are included in. Free spins will multiple your scores tenfold! The more scatters you can match the more free spins you’ll earn! Dead or Alive is a very fun slot to play, one that any fan of the western genre can pick up and get the hang of with little to no worries attached. The additional features do a great job in encouraging repeated play, just remember to play on the max bet settings in order to take advantage of the games high RTP percentage! Be sure to check out Dead or Alive asap! Play real slot games online right here!